Due to a large number of fans deciding not to attend the match at the Emirates, Arsenal has been forced to put some tickets on general sales. This is mostly tickets from season-ticket holders who have decided not to attend the game. There has been growing frustration from the Arsenal fans in recent weeks with their team failing to mount a serious challenge for the Premier League. And this could become worst if Tottenham ends up winning the Premier League. Arsenal were at the top of the Premier League in January and pundits agreed that they were the favorite to win the Premier League. Unfortunately, a poor run of form ever since has caused them to fall down the table and may even miss out on the fourth qualifying place for the Champions League. This poor form has caused many fans to become frustrated with the current manager and asked for the board to replace him. However, there are former players such as Ray Parlour that have asked for the board to stick with the current manager and urged him to sign more quality players to help the team move forward. Arsenal will face West Bromwich Albion on Thursday at the Emirates. With the title hopes gone, The Gunners will have to focus on staying in the top four but could find it difficult with teams such as Manchester United and West Ham on their toes. Arsene Wenger has stated that the focus of Arsenal at the moment is to finish as high as they can and that the players will be ready for the game. They may receive a boost by the return of Jack Wilshere, who has missed all matches for this season so far. 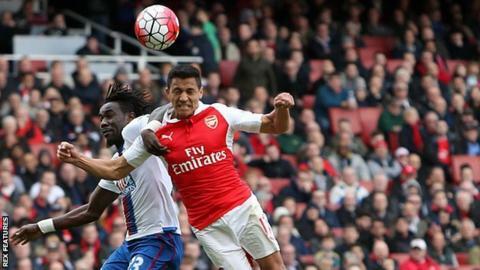 COULD ARSENAL LOSE OUT IN THE TOP-FOUR RACE THIS YEAR?